Protesters demanded the exit of Sudan's President Omar al-Bashir (file photo). These two weeks have proven momentous for Africa's governance in general but more specifically for democratic transformation. 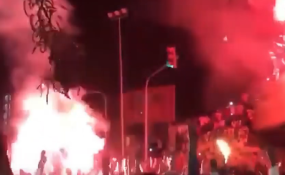 The youth movement forced the capitulation of the perpetually "absent" Algerian president, 82-year-old Abdelaziz Bouteflika, after 20 years in power. It first looked like he might survive this latest round of protests - but something set this crisis apart from previous ones. While the others fizzled out after brutal suppression, the arrest of opposition leaders and widespread repression, this uprising just refused to "go away". This was true even after initial brutal suppression with the death toll reportedly reaching 60. This time the crisis trigger - the country's economic malaise - appeared to resonate with people on the street. This was coupled with the tenaciousness of the Sudan Professional Association which offered organisational strength to the protest. Other factors included the role of the military which abandoned the man they had helped stay in power for three decades. The Sudan Professional Association, made up of teachers, lawyers, doctors and other members of the country's professional elite, was at the very heart of this uprising. The group shared common experiences across the country. It developed a formidable apparatus which offered the protests an organisational backbone. The association's ability to mobilise street protests countrywide placed unusual pressure on the regime's ability to suppress unrest that spread broadly across cities and towns. The fact that the organisers weren't a traditional political class gave them crucial political capital. While some people might have seen the traditional opposition as engaging in the usual political fights and settling scores, the association quickly gained acceptability and trust. For many years opposition political parties were at the forefront of challenging al-Bashir's hold on power. This meant they bore the brunt of state repression and were subjected to arrests, incarceration and exile. This time round, however, the crisis appears to have caught them off guard. Leaders of the three main opposition parties - the National Consensus Forces Alliance, Nidaa al-Sudan and Ummar party - were late in joining the calls for change, ceding the organisational initiative to the non-political class. The time for fundamental political reforms is now. After 30 years of political repression, systemic corruption and subversion of state institutions to serve the entrenchment of al-Bashir in power, the end of an era now comes with acute challenges - but also opportunity. Secondly, there's a pressing need to undertake constitutional reforms. Allied to this would be guarantees of civil and political rights, expansion of the political space for old and new political players and stakeholders and the establishment of new structures of transparency and accountability. Al-Bashir's fall is only the start of a new Sudan.